Well this is more like it. Only 5 months after surpassing the $600k mark I have now surpassed the $700k mark. Part of this is cheating due to the fact that I now include some private stock that was not previously included in my 600k report, but I will take it. It is also interesting that the DOW broke 20,000 for the first time today and the first time I broke $100,000 the DOW was at 10,000 so while the DOW has doubled in size my retirement nestegg has septupled in size. Given the size of my nestegg and the size of my contributions I should now expect to be breaking threw new $100k barriers at least once a year in up years going forward and it will only get easier from there. My worst performers this year include some of my largest positions and favorite stocks and also explains why my stock portfolio so greatly under performed the market in 2016. Under Armour led the way with nearly a 40% drop in value in 2016. I consider Under Armour a great company and a company that will one day surpass Nike in size which would mean outsized gains for me and my portfolio. Stratasys and Proto Labs are part of the 3D printer craze and with 3D Systems are probably companies who have an uncertain future, but for now I will let things play out. Chipotle has fallen on hard times after a Norovirus scare at a couple of their location. Yes they have been hurt in the short term and have some hurdles to overcome, but it is a great company with food that people love and will rebound in the years to come. Tesla is currently nearly my largest stock holding with it and Netflix flipping back and forth. Overall I feel that Tesla over the next 10 years will make me quite wealthy and make the world a better place in the process and is one company I have invested more in than any other company by far. The next few years should be exciting for that position. Continuing on my tradition from previous year’s I have calculated my cumulative investment returns from 2006 until now against the SP500. As I mentioned in recent posts 2016 was a very underwhelming year for my investments and it is reflected in these statistics as well. My NestEgg is now underperforming the SP500 index over the 11 years that I have been investing. Returning a little over 1/2 percent less per year than the SP500 index. My stock returns are still besting the SP500 by a few percentage points which means my 401k has really been lackluster which kind of surprises me as I wouldn’t have expected to have significantly lower returns in there using basically series of Vanguard funds over the years and if I look at my performance that is not reflected so I am kind of at a loss right now. 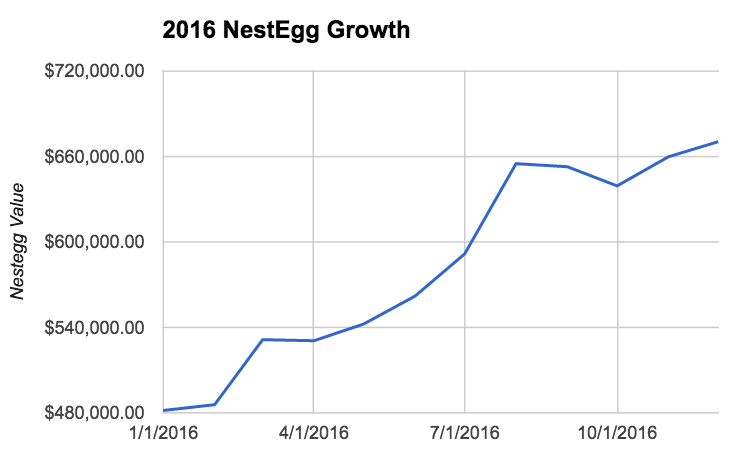 Overall a pretty disappointing year for my Retirement Nestegg. My investments greatly underperformed the market and the market was up a nice amount this year. Overall this is an anomaly based on my previous 10+ years of investing and will not cause me to make any rash changes to my investment philosophy. It is still frustrating though especially when my account is large enough now where even average investment performance probably would have pushed me over the $700k mark. 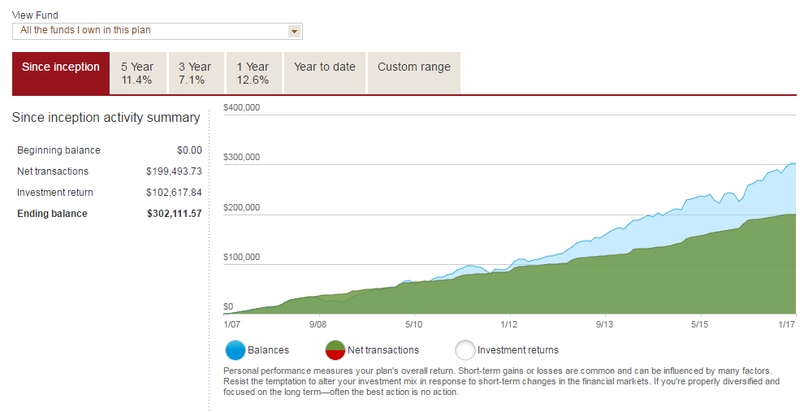 One area where I knocked it out of the park this year was in my investment contributions. 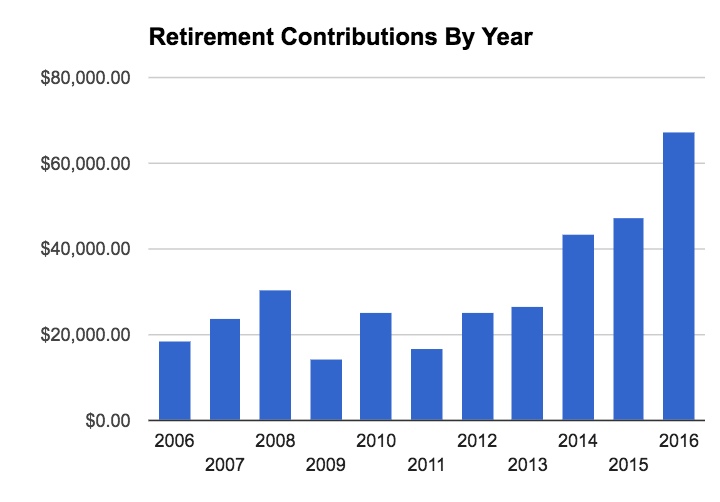 I contributed a record $67,350 to my retirement accounts this year. Part of this was a $25,000 contribution I made to a taxable account with left over money we had after building our house. Overall I want to continue to bump up our taxable account as we start ramping up for early retirement.